In this article I we will explore each of these challenges. 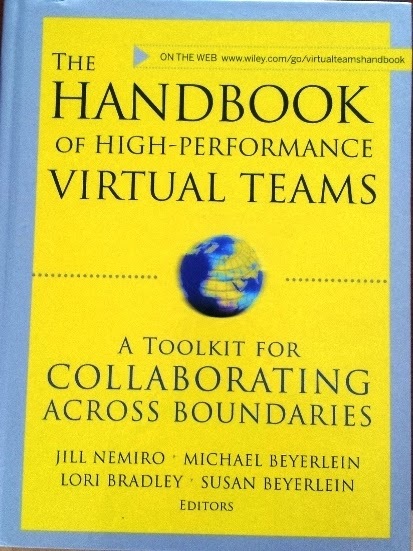 A lot of tips, techniques and frameworks come from “The Handbook of High-Performance Virtual Teams” (see the picture for the whole title and authors) and are supported by my own experience and examples. The main issue with distance is lack of face- to-face interaction, which is crucial to build trust, monitor performance, motivate and understand the cultural differences. Not sure what’s your experience but I feel more connected to my local office and people from my floor or building than my team, although all of them belong to different teams and we have no work interaction at all. But we share the language (not all of us speak Polish, as there are around 30% foreigners working in my location but they try to learn the language and understand our culture), norms, dress codes etc. It’s much easier to build team/community identity when based in the same building. I get involved in many local initiatives and really feel as a part of this great community. Feeling trust is about following the norms/ practices, willingness to share knowledge and cooperate with others and desire to stay with the organization. The main issue with the time when real time communication is required is restriction of time ” everyone trying to use 2 – 4 pm GMT time slot to invite people from 3 continents ” Asia, Europe and US, so you need to schedule your meeting early in advance and if need to reschedule might take a while! On the other hand the advantage is 24 h workday. ü Be careful when rescheduling at a very short notice ” someone from US might have got up very early to attend your meeting and finding out it has been cancelled might be very frustrating ” happened to me once and now I”m more conscious about it. ü might be incompatible (people from different locations might use different technology). Remember: Technology is useful, but less important than techniques to interact! nuisance at best and often a disaster.” Prof. Geert Hofstede. Do not assume the sameness what is normal for you might not be normal for others. We are all different! There are regional, generational, departmental, functional, organizational plus cultural differences, which increase with virtual world as more boundaries need to be crossed. Additional to these a team creates its own culture. ü If cannot effort a visit try to find out more on cultures through reading, speaking to people or visiting a restaurant representing the ethnicity of a team member. Teamwork depends on trust! Communication (keeping people participating and informed) is a key element of trust. Trust is connected with identity (following specific norms/ practices, willingness to share knowledge and cooperate with others and desire to stay with the organization). It’s crucial we know who we are working with to interpret the behaviour and reactions. 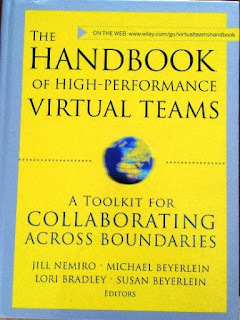 In virtual teams fundamental cues about personalities might be absent if you do not put enough effort to get know each other. Trust is based on knowing and being known by one another and comes from believing in the individual expertise and even most important from sense of accountability, keeping commitments to each other Building trust takes longer when we are not meeting very day and lack of social communication. We need more time to identify team members” habits and skills. ü Make only commitments you can and will keep! A virtual leader needs to be both a leader and a member. Do not control but coach individuals how to control themselves! Use appropriate technology – e-mail not the best tool! Learn and respect other cultures , a visit to a country where you have employees or organize a team meeting where individuals are able to talk about their cultures. When I”m in UK I bake and bring Polish bread and we eat it for second breakfast (around 10-11 o”clock). People in the kitchen not familiar with Polish eating habits usually ask: “Early lunch”? And hear my answer: “No, second breakfast”. A virtual leader is a mentor who shows a high degree of empathy towards their team members and is able to use authority without being perceived as inflexible!